The RiverLink project will deliver better flood protection, better lifestyle and improved transport links for the people of central Lower Hutt. You can use this site to read the latest news from the project team and to gain more information about the project and how it affects you. Greater Wellington Regional Council, Hutt City Council and the NZ Transport Agency are combining their skills and working together on the project, which will bring big benefits to the local and regional Hutt Valley community. RiverLink has reached another milestone! Greater Wellington Regional Council and Hutt City Council now have in place the design for riverworks and the promenade, and fnding is committed in their Long Term Plans. The RiverLink team recently presented the preliminary design to the Greater Wellington Regional Council's Hutt Valley Flood Management Subcommittee and the Hutt City Council Development Committee. Both councils committed to the preliminary design and funding to deliver RiverLink. In 2019 we will start seeking the necessary resource consents. Transport Minister Phil Twyford received an onsite briefing recently. It was a great opportunity to welcome him and discuss how RiverLink has the potential to transform Lower Hutt. One aspect of a significant project such as RiverLink is making sure that programme outcomes align with the government’s land transport system investment strategy. Taking a fresh look at transport priorities provides an opportunity to maximise project outcomes. An opportunity was recently taken to discuss the importance of RiverLink to the Lower Hutt community. While the NZ Transport Agency consider how the new vision for the transport network might apply to the Melling transport improvements project, its full steam ahead for geotechnical investigations. The rest of 2018 will be busy for RiverLink as we gather geotechnical information about what’s under the ground. This will help us protect the aquifer as we refine our designs. You can read more about this below. You will also see some activity around Belmont School with the construction of a trial wetland. One of the most important aims of RiverLink is to keep our river healthy. Constructed wetlands will filter stormwater runoff before it reaches Te Awa Kairanga / Hutt River. Next month, the RiverLink team will start investigations to better understand the geotechnical complexities of the Hutt Valley. This work will inform the design of the new stopbanks, a large retaining wall which will support the promenade, piers and abutments for the pedestrian cycle bridge and help us understand the costs for building a highway interchange and new Melling bridge. We also expect the findings to help us understand how a nearby major fault line could impact our designs and how best to protect the aquifer beneath the surface. From August to October 2018 you can expect to see all manner of machinery both in and around the river. We’ll use excavators, drill rigs and other geophysics equipment – all in accordance with resource consent conditions. This work will take place on both sides of the river from just upstream of Melling Bridge to the Ewen Bridge. The enclosed map shows where the work will be done. At some locations, there will at times be limited access to the river. There will be traffic management in place along Daly Street and the Melling railway station carpark while work is done at these locations. More details about what to expect will be available closer to the time. Every three years, the government issues an investment strategy on the land transport system called the Government Policy Statement on land transport, also known as the GPS. The GPS is a document that guides land transport investment over a ten year period. Transport investments have long lead times, high costs and leave long legacies. Good transport investments therefore require careful planning to ensure that today’s transport network will be able to meet our future needs. The NZ Transport Agency are now working with councils and others to realise the new vision for the transport network outlined in GPS 2018. This work means taking a fresh look at transport investments across the country, including the Melling transport improvements project, to ensure that they align with the new priorities of GPS 2018. At this stage, the Transport Agency cannot say how the Melling project plans will be affected until the process of carefully looking at the options is further along. Some projects may need to bring amended plans back to the community to allow them to have input and express their views. To ensure that this work is robust and delivers the best outcomes, the process is expected to take approximately three to six months. In undertaking this work, the Transport Agency will take into account the outcomes that are the priority for the Wellington region as set out in the Regional Land Transport Plan. The Transport Agency's team will complete the work as quickly as possible while not compromising quality. We will update you again as soon as we are able to share more. Updates will be published on the Transport Agency website as it becomes available here. Over the past few years you’ve told us how important flood protection is, how we can improve your ability to move around Lower Hutt and what kind of urban experience you’re seeking. This map shows the positive changes RiverLink will deliver when fully implemented. All RiverLink partners were involved in narrowing down the interchange options. Working closely together ensured that implications for the stopbanks and urban renewal were considered alongside the transport effects. We have considered 43 options for a new Melling interchange. The project team have narrowed the options down to three designs for a diamond interchange and a new bridge over the river connecting into Hutt City. For more information on how the options were selected, please take a look at the ‘Engagement Display Boards’. future proofed for a possible extension of the Melling railway line. We will use your feedback, alongside technical information, to select a preferred option. NZTA will make decisions on the above. Feedback is open until Sunday 10 June 2018.
destination while promoting the vision for RiverLink. The Riverbank beach provided a fantastic backdrop for casual conversations to occur at the information container on market days, after people had bought their veggies for the week. Plenty of people making use of the Hutt River Trail stopped to find out what the container was all about as well. With the RiverLink container having a presence over the summer, the team got to know some of the families regularly using the space – which was lovely. Over the lazy summer days, (with a few downpours to keep us on our toes) all sorts of issues were covered such as transport linkages, city growth, the future of the market, the Hutt River’s water depth and toxic algae. There was also interest around associated projects including the Te Awa Kairangi / Hutt Environmental Strategy Action Plan and Hutt Central City spatial planning. The Festival of Rock was designed as an opportunity to discover what hides along the shores of the Hutt River. The kids marvelled at the creepy crawlies living in the Hutt River and were particularly amazed at the crabs! The Riverbank beach was a hive of activity with rock art, skimming competitions, rock pools and face painting. We made sure that marvellous local coffee was part of our container talks too. The RiverLink Easter Rock Hunt was buckets of fun on Easter Sunday. Kids searched the beach for a blue rock, and then with chocolate in hand decorated their rocks with splendid creativity. The last event in our summer series, 240 people (adults and kids) enjoyed the space with us on a glorious sunny day. While the kids were out hunting it gave their parents a chance to pop in for a coffee and chat about the RiverLink project with the project team. We had such a great time together at the River and there’s no doubt that the Riverbank beach will be teeming with locals next summer too. cancelled. Thank you to everyone who registered. RiverLink would like to extend an open invitation for groups (minimum 10 people) for a guided walking tour of the RiverLink city section between Ewen and Melling Bridges. Get your friends together and once we have the minimum number we will send out an invitation to arrange a date and time. It’s an opportunity to stand in the space and visualise where things will be and how it all fits together. If a new Melling station is built south of the current station, there are opportunities to preserve what people like about the current station and to consider additional amenities. The RiverLink team conducted an online survey to learn what people would like to see at or nearby a new station. Forty-three people took part in the survey. Topping the wish list of amenities were weather protected waiting facilities, good pedestrian and cycling access to the station and security measures such as security cameras and lighting. Suggestions of ‘other’ things people would like to see included: ticket kiosk, public toilets, bike lockers and post boxes. The two most popular businesses and services people wanted to see near the station were a mini-mart and restaurant/take-away. Consistent with what the project team heard when talking to commuters, there were also numerous suggestions to extend the hours and days of operation and extend the line further north. additional walking distance from the western hill suburbs as the reason. The week of 20 November, the RiverLink engagement container was set up at the Melling train station and commuters were invited to tell the project partners what they thought about moving the Melling station south of its current location. “The people who use the station every day have important insights that will help us shape the next steps of the project. We were delighted to hear that people largely support moving the station and are enthusiastic about our opportunity to rejuvenate Hutt centre,” says Rebecca Polvere, RiverLink project manager. The project team were available at the container during the morning and evening commute to explain the proposal to commuters and hear their thoughts on how such a move would impact their commute. During this time about 200 people visited the container and talked with the project team. While most commuters said that shifting the station 250 to 500 metres south of its current location wouldn’t significantly impact their commute, many raised the merits of extending the Melling line further north so that additional suburbs would have access to public transport. A number of commuters also suggested extending the hours of operation later into the evenings and offering weekend service. be safer, quicker and easier to cross,” says Rebecca. Parking was another hot topic. People strongly supported the proposal to provide additional parking at a new station but some wondered how the loss of the riverbank parking would impact parking availability for commuters. Several people mentioned that station parking is currently being taken by people who don’t actually use the train but instead work in Lower Hutt and are attracted to the free parking. The project team were encouraged to consider ideas on how parking at a new station could be managed to meet the needs of the community. The information contained in [reports] is intended to provide information regarding the Preliminary design for the flood protection and associated elements of Making Places. GWRC nor HCC accept any liability of any kind arising in any way out of the use by a third party of any information, product or process disclosed or recommended in the [reports], nor does GWRC or HCC accept liability arising out of reliance by a third party upon any information, statement or recommendations contained in the [reports]. Should third parties use or rely on any information, product or process disclosed, described or recommended in the [reports] they do so entirely at their own risk. GWRC excludes all liability in relation to information in the [ reports] whether in contract, tort ( including negligence), or otherwise, for any loss or damage however caused ( including direct, indirect, consequential, special or exemplary loss or damage, or loss of profits, loss of revenue, loss of data, loss of savings and loss of opportunity). The [reports] may not be reproduced in whole or in part without the prior written consent of GWRC. To request permission, contact GWRC. A serious flood would pose a risk to lives, livelihoods and more than $1billion in assets in Lower Hutt. The RiverLink project includes the upgrade in flood protection on the stretch of river between Kennedy Good and Ewen bridges. This will involve widening the river channel, raising the height of the stopbanks, improving floodway capacity at the Melling Bridge and enhancing the riverside environment. This RiverLink project provides an exciting opportunity to better connect central Lower Hutt with the Te Awa Kairangi/Hutt River, contributing to a more vibrant city centre. A riverside promenade is proposed for the eastern bank of the river in Lower Hutt's CBD. The promenade is being designed to sit on the top of the stopbanks being developed. Some aspects of the proposed design are improved access to the river, development of amenities and encouragement of mixed use development, such as apartments. The potential impact of the project on the local road network is also being considered. 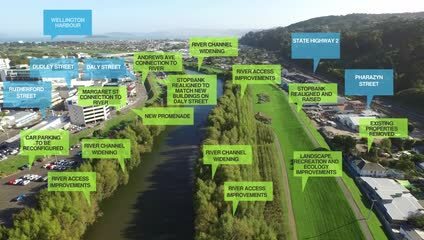 This better connection with the river is a priority of Hutt City Council's Making Places project, which sets out how the community would like Lower Hutt's central business district to develop by 2030. What outcomes and benefits does RiverLink aim to deliver? Why are improvements needed at Melling intersection? What are the options for Melling transport improvements? What will happen to the Melling railway station? Why isn’t the Melling line being extended to the north? What will happen to the Riverbank Market?